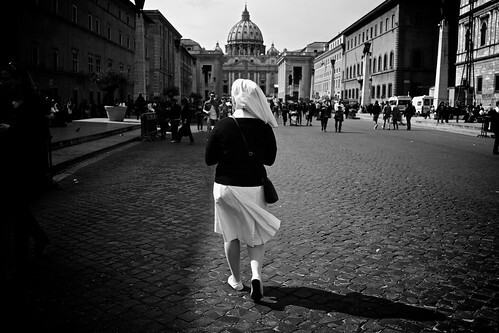 41/365 – “Habemus Papam” nr.13, a photo by Luca Rossini on Flickr. How many nuns are in Rome? This is really a difficult question, but if I had to give an estimate, I would say “an utterly impressive bunch”. Yesterday I told you that we host more than 400 churches in the sole city of Rome, so it’s easy to extrapolate that the number of convents must be pretty high too. And they are always around, doing their jobs, most of the times out of the convents. We have a huge number of Catholic schools, from nurseries to universities, Catholic hospitals, Catholic hospices, Catholic charitable institutions, and I’m sure I’m missing out something, so there’s plenty of work for nuns in this city. Then, we host the Vatican City and the Holy See, with the Pope, the papal basilicas, the relics of the Apostles and many other major saints, a lot of important churches, and again I’m sure I’m missing out something, so there’s plenty to see if you are a nun which lives abroad. I’m talking about religious tourism here, and not about pilgrimage, which also accounts for a big bunch of nuns traveling to Rome from abroad. Almost every one born Roman has seen his/her first nun when he/she was just a few minutes old, since nuns work in almost every pediatric hospital. Since every baby has more chances to win the lottery than to get accepted in public childcare, and at the same time religious nurseries tend to be the cheapest option around, so actually most of the Romans happened to spend every morning of their childhood with the nuns. Plus, until sixty years ago a girl could either get married (if she could find a husband and her family could provide the proper dowry) , work as housekeeper for one of her brothers, or be ordained nun. So, numerous families could hardly afford more than a few weddings, and the remaining daughter had usually to chose between one of these two fates. I had two nuns as great-aunts myself (plus one who preferred to be the housekeeper of my grandfather). Beautiful image. I really like the way Sony renders black and white, even in the Nex series. Nice work! !